Nathan Chen performs his long program at the 2017 U.S. National Figure Skating Championships. Nathan Chen became the youngest man since 1966 to win a U.S. men’s title at the 2017 U.S. Figure Skating Championships after a technically-packed routine. Vincent Zhou and Jason Brown both moved up one spot for the silver and bronze, respectively. Chen is coming off a hip injury he sustained last year during the Smucker’s Skating Spectacular at 2016 U.S. Championships, and appreciates Brown’s dilemma (stress fracture). It was a long road for Chen as well. 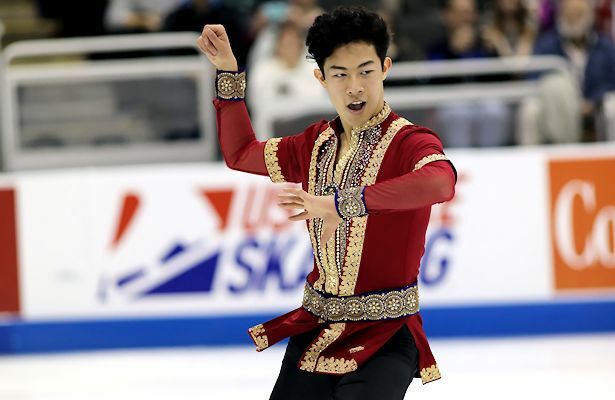 Chen did not disappoint in his enthralling routine to “Polovtsian Dances.” His program featured a grand total of five clean quads: quad Lutz-triple toe, quad flip, quad toe-double toe-double loop, quad toe, and quad Salchow. The fearless skater also produced five triples, racking up additional points for strong spins and footwork. He earned an instant standing ovation and scored a record 212.08 points for first place in the long and overall (318.47). Zhou was the last man to take the ice, showing quiet determination after Chen left the ice. The 16-year-old stepped out of his opening quad Lutz, but landed the quad Salchow-triple toe and a triple Axel-double toe. His “Casablanca” routine also featured another clean quad Salchow, as well as a total of seven triple jumps. The teen received a level four on all three spins, as well his straightline steps, and finished in second place in the long (175.18) and overall (263.03). Zhou also overcame injury when he tore a meniscus in his right knee, forcing him to sit out the entire 2014-15 season. Dealing with a stress fracture, Brown had the lowest planned content of the top men. The 2015 U.S. national champion landed six clean triples in his routine to music from The Piano. With the audience behind him, he showed high level spins and footwork, earning positive GoEs. The only error was in the last jumping pass where he stepped out the triple Lutz (meant to be a combination). The 22-year-old scored the highest program component score (92.48), placing third in the long (175.00) and overall (254.23). Grant Hochstein stepped out of his opening quad toe in his dramatic routine to Pagliacci, but came back to land a triple Axel-double toe and quad toe-double toe. He had a few minor errors on other jumps, but otherwise showed good spins and footwork, earning 169.21 for a fourth-place finish in the long and overall (248.31). Last April, the 26-year-old got engaged to fellow skater Caroline Zhang, who finished fifth in the ladies’ discipline. Alexander Johnson, who stood in ninth after the short, put out a solid routine which featured six triple jumps. He showed good speed in his well-choreographed routine to “In Your Eyes,” which featured high level spins and footwork. He placed fifth in the long (158.20) and moved up to sixth overall (233.39). Ross Miner, who stood in second after the short, struggled with jumps in his long to a Queen medley, underrotating his opening quad and missing the takeoff on his triple Axel. He also fell on his second triple Axel attempt. The 2013 U.S. national silver medalist managed to land four clean triples for an eighth-place finish in the long (151.67). He slipped to fifth overall (240.34). Timothy Dolensky finished seventh (228.76), followed by Sean Rabbitt (228.02).